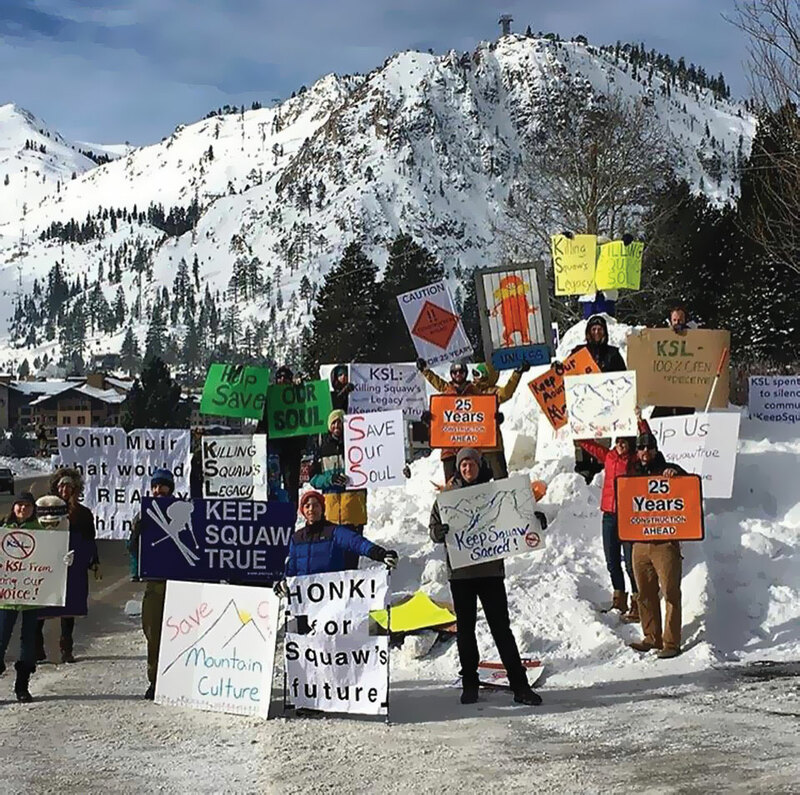 An article in the hard copy version of the Business + Technology section of the Mercury News, on August 13th, was titled, "Squaw Valley expansion plan moves forward." A heading just above the title read, "$1 billion project at ski resort." The picture accompanying the Mercury article depicted an aerial tram, conveying skiers to the top of the ski runs. Like the picture above, which makes a different point, it showed a lot of snow. The Mercury article is pretty convincing that there are many environmental reasons to object to the latest plans, which call for the construction of a 90,000-square-foot indoor adventure center and water park, plus the addition of nearly 1,500 motel rooms, condos, timeshares and retail space in Olympic Valley. Protesters are out in force, as is evident from the picture above. The California State Attorney General, Kamala Harris, has warned the developers that the project is highly problematic, with Harris claiming that increased traffic from the proposed development would pose public safety concerns. 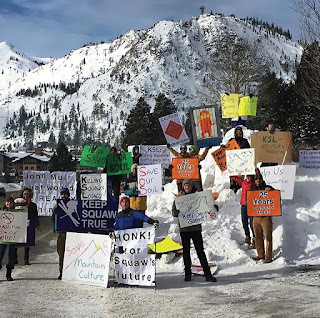 Fighting well-organized environmental opponents, who can count on the assistance of the Attorney General, might give investors pause, as they think about whether or not they should plunk down $1 billion for this proposed ski resort expansion. If the investors are not thinking about this problem, they should be. However, I would like to raise another cautionary point, related to the investment potential of this proposed ski resort project. Ski resorts need an abundance of snow. Given our global warming crisis, it is very unclear, to phrase it optimistically, that California is going to have an abundance of snow in the future. See the picture below, and read the article from which I grabbed it. Are you investing in this proposed project? Be careful! It may be that your retirement mutual fund is planning to use your retirement nest egg for this ugly and destructive project. The project has passed one planning hurdle, and maybe it can get final approval, and maybe it can survive a court challenge. The developers, however, are still going to have to deal with that problem about snow! By all accounts, it is highly likely that there isn't going to be a lot of that stuff to go around. It may well be that this proposed development scheme is not that great of an investment opportunity! 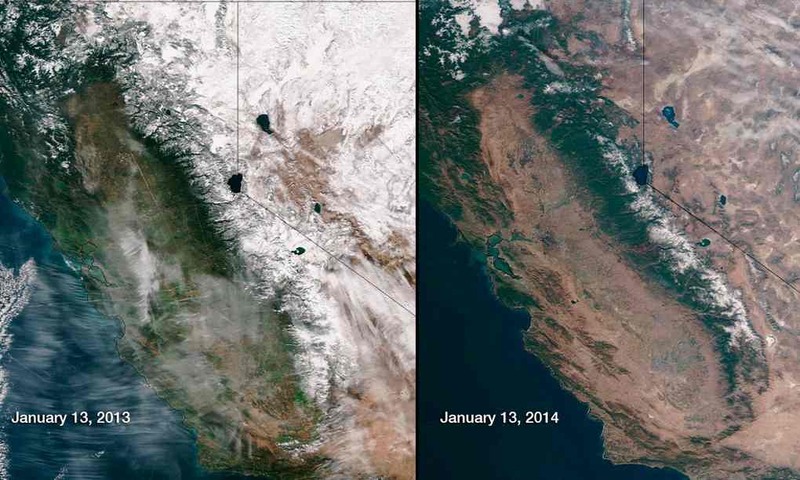 Of course, loses to investors in ski resort projects are a minor problem compared to the problem that affects everyone in California: how are we going to survive with something like 30,000,000 people dependent on a water supply system that depends on snow?